There are days when you shouldn't bake. Not because it's too humid or because you're running low on flour, but because you're too hungry. I had one of those days recently. 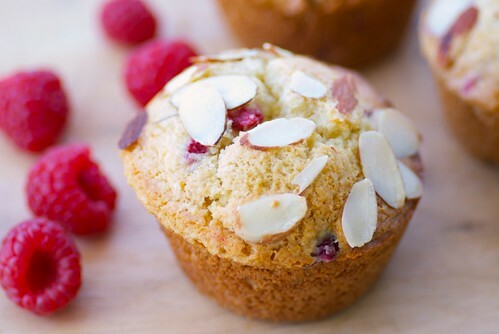 The day I made these Lemony Raspberry Muffins with Ginger and Almonds. These raspberry muffins are not low-fat or low-carb. They're made with real butter, white flour, and coconut milk. And despite the fact that it's bikini season, I ate them hot-out-of-the-oven, grilled with butter, dabbed with apricot jam, and cold straight from the fridge. Why? Because after my My Mom's Jordan Marsh Blueberry Muffins, these may be the best muffins I have ever eaten. When they bake, the honey, ginger, and almond mingle to emit a sweet yet earthy fragrance. 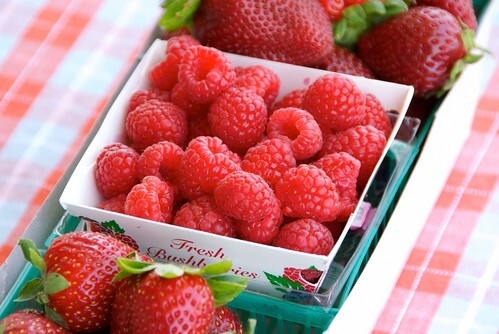 Then when you bite into the crunchy almond-dotted muffin top, you discover big, juicy raspberries that burst with flavor. So make these raspberry muffins. Just don't make them on a hungry day. 1. Plack rack in center of oven and preheat to 375 degrees F. Spray a 12-mold muffin pan with cooking spray. 3. In a separate bowl, combine coconut milk, butter, and egg. Add lemon zest, lemon juice, honey, almond extract, and ginger, and whisk until just combined. Add to the flour mixture, and stir quickly until well combined. Fold in the raspberries. Spoon batter evenly into the 12 molds. Sprinkle tops of muffins with sliced almonds. 4. Bake for 18-20 minutes, or until the tops are golden and a cake tester inserted into the center of a muffin comes out clean. Transfer the pan to a rack to cool for 5 minutes before removing each muffin and placing on a wire rack to cool. I always tend to bake on my hungry days. Seems like a good idea until I'm 7 muffins in! Don't those look pretty! I baked zucchini bread on Sunday, and half a loaf is gone, so I agree about when NOT to bake! But I'm hungry every day and these look too good to resist. These sound dangerous. Really dangerous. But that means I will probably end up making them at some completely inappropriate time. Like right before I'm about to go on a weeklong cruise. And will have to wear a bikini. I am so guilty of baking on hungry days! But for me that often means more cookie dough than actual baked cookies making it into my tummy! Those look good! I've never used coconut milk in muffins, so I'll have to try these. Perfect! I love the idea of using coconut milk. I absolutely love the raspberry lemon combination and am a huge, huge fan of ginger, so these are definitely going on my list! Delicious - I love using coconut milk in muffins and cakes as it adds nice flavor and moist texture. These do look like delicious muffins! And, that ingredient list confirms it. Love all the great flavors in these. I always bake with bluberries but not raspberries and I don't know why since I love them. THanks for the amazing recipe! I'll be trying it soon! Gorgeous raspberries - this is a must-try recipe. tw-Oh, zucchini bread kills me every time. foodhunter-I'm always hungry too. What's up with that? val-I know. And I did. ramblingtart-The ginger is so refreshing and complements the tart raspberries deliciously. anna-You should try it. I like baking with coconut milk. lisaiscooking-I love that ingredient list too! anonymous-Glad to have given you a new idea! Delicious Susan...those raspberries...I'm afraid it won't make it to the muffins in my house...! Beautiful muffins...and I love the flavor of if...raspberries and lemon...yummie! Oh my - these would be dangerous to have around. I'd eat a whole batch by myself. I just made your mom's Jordan Marsh Blueberrry Muffins this weekend... and they would be hard to beat! But I guess now I'll have to try! I must try these. The coconut milk is an interesting ingredient. I thought these looked good at first glance and then I saw the addition of coconut milk and I was hooked! I love everything about coconut milk, so I'll definitely be trying these these, they sound amazing. Thanks for sharing! juliana-They really compliment each other. ann-Yay! I'm so glad you liked them. And, yes, now it's time for the raspberry ones! teachercooks-It's really lovely in muffins. jessie-I do too! I always have a couple of cans of it in my cupboard. It's great for baking, soups, and sauces.